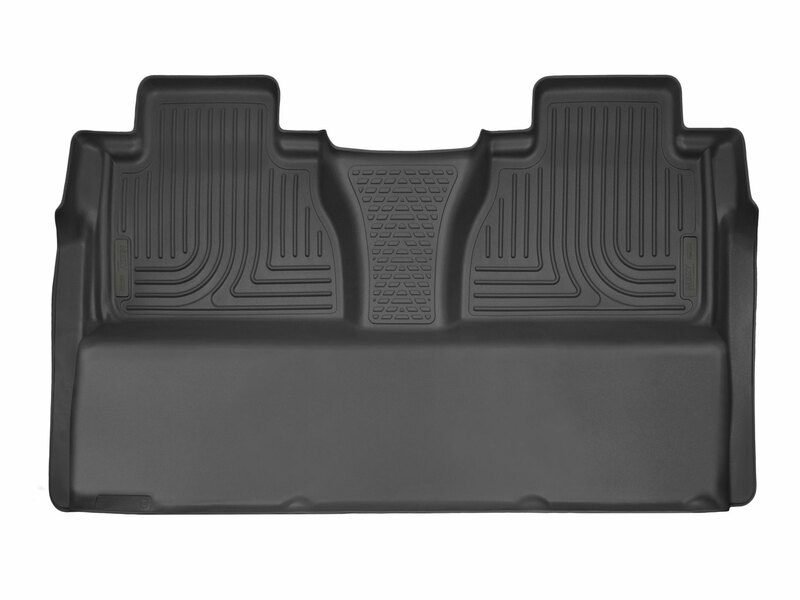 WeatherTech Floor Liners for the back worth it? Discussion in 'General Tundra Discussion' started by PA452, Aug 8, 2018. Planning on picking up the front WeatherTech floor liners for my new double cab. The TRD O/R mats are fairly nice, but they just don't have the coverage of the WeatherTechs. My main concern is in the winter, the WT liners will be much better at containing melting snow and ice. My question is about the back. Anyone with a double cab have the WT liners for the back? It won't be all that often that I have anyone sitting back there. I have the TRD O/R mat for the back as well, I guess I'm really just wondering if the WT back liner provides much better coverage than the mat that comes with the truck? Before you buy the weathertech, which are fine...I'd look into the Husky X-act contour. I have them, as many do...softer material and fit amazing. Boerseun, jeffw6236, Vendeta2k and 1 other person like this. I'll take a look at them. What makes you prefer the Huskys over WeatherTech? Weathertech look like a floor shaped bowl set in place where they actually have a gap between the carpet and the liner. To stiff for my taste. Some people like them though...I havent met one though . Someone makes custom inserts for the Husky liners as well. Not sure about the Weathertech's. I owned a set of weathertech’s on my last vehicle. They are overall very flimsy. They would distort in the summer from the heat. Eventually you will have a dent and a badly warn spot under your right foot. Now I have a set of the husky x-act and I would go back. The material is much thicker. jeffw6236 and zman320 like this. My wife has weathertechs in her Tahoe, I hate them, they deform with heat, slide all over the place. I've got huskys in my tundra. My opinion, huskys should be the only aftermarket floor mat made. Don't waste your hard earned money on weathertech. 15whtrd and Voyagermike like this. I’ve had the Weathertech for a year. Perfect fit, no issues. Hmm. I've had WeatherTechs in two other vehicles and I've never had any deforming issues. I have Husky Weatherbeaters in the front and Weather tech digital fit in the back of my crewmax. I feel it's the best combo. Scpringle and Runnerstrom28 like this. I have Weathertechs. Specifically speaking for the rear, I think the fitment and coverage is great. Covers the entire floor including under the seat. The downside with them is the passenger front, which doesn't stick well at all and slide all over when someone steps in. Don't know why Toyota didn't put in the locks like on the driver's side. Scpringle and 15whtrd like this. Husky has little plastic spikes, I know that isn't a tech ical term haha, that keep the front mats secure. Zero slippage, excellent coverage. The Weathertechs do also. LOL. I know they're designed as floor liners, so I wonder if the idea is to leave the stock mats in place and put the liners on top. But that seems stupid to leave to OEM mats. Nah, the liners are definitely not intended to work over the OEM mats. I had the weather techs....switched to the more pliable husky liners...couldn’t be happier. IMHO the huskys are easier to take care of and look better over time. ofter material and fit amazing. I had to return 2 X-ACT sets as the back was deformed and looked like crap. Gave it a week in a hot truck and still didn't hug the back like they are supposed to. The fronts are nice though. Poor packaging is to blame. They just fold them up and ship them that way. For as much as they cost, they can afford to ship them flat. To answer the original question, the Weathertech design has a great benefit for crewmax trucks because it covers the area under the seat. So when my muddy duck dog jumps in my truck he has the entire floor to lay around on. The benefit is less interesting in the double cab trucks because of the underseat storage on the DC trucks. There’s nothing extra to cover vs the factory mats. DalTee, Runnerstrom28 and 15whtrd like this. I've got Weathertech in the jeep, raptor, Tacoma, and the Pro. The only car I don't is the wife's 640. They seem to work. That rear is a Husky? Looks just like a WeatherTech. Another vote for the Huskys! I don’t have the husky rear I kept my Toyota all weather rear and it has worked well for me. I don't want to knock the Weathertechs; they are okay and a lot of people have them. But, I work for a construction company - we have a fleet of trucks that get worked hard. Some have Weathertechs and some have Husky's. When new they perform about the same. A few years in the Weathertechs get hard, slippery, and bend out of shape. The Husky's still look like new. I have Husky X-act Contours and based on our experience here with our fleet that's what I would recommend. Our fleet manager has also come to the same conclusion with future vehicles. Now I just have to convince him to get Tundras instead of these damn Chevies and Fords. But that's another story. Are the full rear coverage Husky mats, new??? I went weathertech because Husky didn't have the full coverage in the rear. FaCK! I have Husky with full coverage in the back. Got them in February, so I don't know how new they are, but at least available since the beginning of the year.